Cellular functions are tightly controlled by complex signalling networks and dysfunction of these networks often lead to development of diseases. Protein interactions and post-translational modifications such as protein phosphorylation play a key role in signal transduction networks by regulating the assembly of signalling complexes and by controlling the activity of enzymes that regulate signalling flux. Only few components of signalling cascades have been studied in detail and the role of many enzymes and scaffolding proteins in signalling remains therefore enigmatic. Our research group is interested in the molecular mechanisms that regulate cellular signalling networks and how these mechanisms can be exploited for the design of selective inhibitors. My group at the Structural Genomics Consortium (SGC) determined a large number of high resolution crystal structures that led to a comprehensive structural coverage of large protein families such as protein kinases, phosphatases as well as protein interaction domains. Family wide structural comparison revealed novel and often unique mechanisms of regulation as well as unique binding pockets. We are exploring these regulatory mechanisms for the development of highly selective chemical tool compounds (chemical probes) that can be used to unravel signalling pathways and to explore the utility targeting signalling molecules for the development of novel treatment strategies for diseases. We are particularly interested in epigenetic reader domains, small protein interaction modules that “read” the epigenetic code in chromatin and play a critical role controlling gene expression programs. Probe development efforts led now to an almost complete chemical tool kit for human bromodomains, a family of acetyl-lysine dependent epigenetic reader domains. In addition, we are developing novel strategies targeting protein kinases, a large superfamily of signalling enzymes that principally control phosphorylation dependent pathways and that are among the most frequently mutated enzymes in cancer. Examples of chemical probes: Left panel: Binding mode of the selective ERK1/2 inhibitor SCH772984. A novel binding mode targeting an allosteric pocket confers high selectivity for ERK1/2. 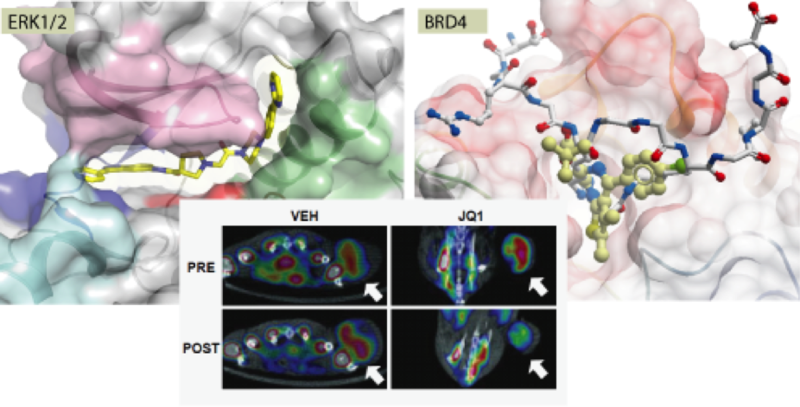 Right panel: The bromodomain inhibitor JQ1 binding to the first bromodomain of BRD4 (yellow carbon atoms). A superimposition with an acetylated histone peptide is also shown. Central panel: Selective inhibition of BET bromodomains causes growth inhibition of NUT midline carcinoma tumour cells in mice (monitored by positron emission tomography (PET) after 4 days exposure to JQ1).